The Association for Manufacturing Excellence (AME) today announced four recipients of the AME 2017 Excellence Award. The AME Excellence Award primarily recognizes North American manufacturing plants that have demonstrated excellence in manufacturing and business. The award acknowledges continuous improvement, best practices, creativity and innovation. Recognized among those four recipients is Powerblanket, the smallest company ever to receive this award. The leader in total temperature control, Powerblanket designs and manufactures high technology smart controls and monitoring devices, heating blankets, and chilling products that solve a wide range of temperature problems in industries such as oil and gas, construction, industrial, mining, and railroad. The AME assessment team highlighted Powerblanket’s great culture throughout the company. The team also commended Powerblanket’s improvements and impressive turnaround, especially for only being three years into its lean journey. The award presentation will take place on Oct. 25, 2017. Powerblanket is a great example of problem solving and innovation in industry. A concrete worker in Salt Lake City, UT wanted to work more efficiently year-round. He worked with an engineering professor at the University of Utah to create an efficient heating technology that would cure concrete quickly and with maximum strength. They developed an innovative concrete heating product and founded Powerblanket, which soon became a leading manufacturer in the concrete industry. This technology proved to solve many temperature problems for applications across many different industries, and they began wrapping barrels, buckets, pipes, and tanks. From there they developed an expertise in temperature control, built a world-class custom design team, created control devices, and entered the industrial cooling industry with a new line of chillers and cooling blankets. What started as a solution to a common construction problem, has turned into an industry-leading company that engineers and manufactures temperature control solutions for many different industries all over the world. The AME Excellence Award has a rigorous selection process that begins when a company submits an extensive achievement report based on the AME Excellence Award evaluation criteria. Achievement reports are evaluated by the AME award assessment team. For companies that score high enough in this achievement report review, an intensive site visit is completed, during which a volunteer team of manufacturing practitioners validates the submitted achievement report. Recipients of the Excellence Award are selected based on the combined results of the achievement report review and site visit feedback. The AME Excellence Award is not something that can be achieved by one person or one company leader. It takes all team members working together to achieve the level of enterprise excellence that the AME Excellence Award recognizes. With that in mind, AME representatives will visit award recipients’ facilities to present awards in person so that everyone working in these facilities can participate in the celebration. Recipients will also be honored at the AME 2017 International Conference, taking place Oct. 9-13 in Boston, Mass. Recipients will share their best practices with other lean and continuous improvement practitioners in attendance. To learn more about the Excellence Award and the 2017 recipients, visit www.ame.org/excellence-awards. Heat Authority has researched the leading products for industrial and job-site productivity and offers the widest variety of heating and cooling accessories to make working in any environment easier and more efficient. Cold weather got you stuck? Unfavorable warehouse conditions? Hazardous area environment? Construction site issues? Need better equipment to get the job done? Heat Authority has a product to help solve your problem. With products for almost any industrial application, Heat Authority is one of the very best resources for industrial equipment supply. With a low price promise and FREE shipping on almost every product site-wide, Heat Authority offers heated concrete curing and ground thawing blankets, drum and IBC tote heated jackets, hot plates, furnaces, lighting, machinery, welders & generators, including freeze protection products and warehouse lighting solutions. Construction contractors and utility excavators rely on the light towers heated construction blankets. Warehouse managers and manufacturers demand the drum & tote heaters. Concrete finishers require the concrete curing heated blankets to keep their crews working all winter long. Everybody loves the low price guarantee on EVERY product site-wide. Heat Authority knows that time is money and do their best to help their customers save money & stay on schedule all season long. Distributors like Heat Authority are vital to the success of Powerblanket, and we appreciate and value these partners for all they do to help us deliver heating solutions all over the world. If you are in search of Powerblanket heating solutions, Heat Authority is a trusted and reliable source. What Temperature is Too Cold to Pour Concrete? Experts agree that the best temperature to pour concrete is between 50-60°F. The necessary chemical reactions that set and strengthen concrete slow significantly below 50°F and are almost non-existent below 40°F. Even when daytime temperatures are within the satisfactory range, winter concrete setting creates risks that could result in weak, inadequate concrete. If nighttime temperatures are below freezing, the water in the concrete will freeze and expand, causing cracks. Additionally, if temperatures reach below 40°F (but not freezing) during set time, concrete will take much longer to reach required strength. However, if the correct measures are taken, concrete can still be successfully placed during even the coldest months of the year. Use extra cement (typically 100 lb/cubic yard) to make the reaction hotter and cause concrete to hydrate more rapidly. After implementing the above suggestions, It’s important to consider how you will keep concrete at the correct temperature during the curing process. Concrete must maintain a temperature above 50°F for approximately 48 hours for the correct chemical reactions to take place, allowing the concrete to eventually settle at 4000 psi. Two popular options used during cold weather concrete curing are heated enclosures and insulated blankets. If using an enclosure, ensure that the structure is both wind and waterproof. Additionally, ensure that there is proper ventilation for the space heater. Heaters cause an increase in carbon dioxide that could cause carbonation in the surface of the concrete, not to mention a work hazard for employees. Powerblanket® concrete blankets are an extremely effective option for attaining and maintaining the correct temperatures for concrete pouring and setting. Powerblanket® concrete blankets can be used to thaw ground before pouring concrete and again after finishing to keep concrete from freezing. Utilizing Powerblanket concrete blankets will ensure that concrete is kept at the correct temperature for the necessary reactions to happen quickly and the desired strength to be reached. With Powerblanket, it’s almost never too cold to pour concrete! Temperature makes all the difference when pouring concrete. Check out our article on how temperature affects concrete that is still curing inside the Hoover Dam! How long does concrete take to set? The continual hardening occurs because cement particles react with the water in the mix (hydration), and as long as cement is in contact with moisture, even miniscule bubbles, it will continue to form bonds. This is minimal after “full strength” is achieved, but it is continual. In standard industrial cases, full strength concrete is recognized at 28 days. At seven days, you should have concrete that is cured to 70% full strength or greater. But to answer the question of, “How long does concrete take to set?” concrete setting time is generally 24 to 48 hours. At this point the neighborhood dog will not leave his footprints in it, but you should keep it clear of heavy equipment during this time period. Most mixes are cured at 28 days. Moisture plays a critical role in curing time for concrete. If there is not sufficient water in the mix, the concrete will cure too fast, resulting in weaker overall strength. Too much moisture, often used in the finishing step will weaken the top layer and cause flaking. Hot ambient temperatures and wind accelerate the evaporation of moisture–speeding concrete setting time. The mix design has a lot to do with concrete setting time. Some jobs will require accelerants because the area needs to be usable as soon as possible. The accelerant will do its job and speed up the concrete setting time. Accelerant mixes will show a weaker overall strength in the end, but will still meet strength requirements. Temperature also has an impact on concrete setting time. For more information, check out this article about how concrete curing temperature makes a difference. The FluxWrap from North Slope Chillers is portable cooling equipment that will keep newly poured concrete safe from heat, regulating concrete setting time in both regular and hot conditions. The FluxWrap is combined with either a cooler or chiller to achieve optimum results. The Circulation Blanket draws heat to the blanket in order to cool the concrete. Use Powerblanket’s patented heat-spreading technology in reverse–the cooling blanket draws heat away and lowers the temperature of the concrete. Take it with you on every jog. It is easily portable. If conditions are cold, concrete curing blankets provide a manageable way to cure concrete effectively and confidently. Powerblanket curing blankets increase production by rapidly curing with consistent, even heat. Realize that just because you have a concrete curing blanket doesn’t mean you have a solution. The type of blanket and how that blanket is used will have a massive impact on your concrete. Read more about curing blankets here. How Warm Does it Have To Be To Pour Concrete? Whether the conditions are hot or freezing, the ideal concrete curing temperature should be maintained at about 55°F to achieve the optimum concrete strength. At its completion in 1935, the Hoover Dam was the largest dam in the world and a marvel of labor and engineering. The first pour began on June 6, 1933. Rather than being a single block of concrete, workers built the dam as a series of individual columns. The trapezoidal columns rose in five foot lifts. This method allowed the tremendous heat produced by the curing concrete to dissipate. If the dam were built in a single continuous pour, the concrete would have gotten so hot that it would have taken 125 years for the concrete to cool to ambient temperatures. The resulting stresses would have caused the dam to crack and crumble away. The heat and dryness of Nevada posed additional complex problems with the pour and concrete curing temperature. When the concrete was first poured, river water circulated through cooling coils of 1″ thin-walled steel pipes. Once the concrete had received a first initial cooling, chilled water from a refrigeration plant on the lower cofferdam circulated through the coils to finish the cooling. We live in a world where faster always seems better; however, concrete that cures too quickly or under hot concrete curing conditions can actually result in weak or unstable concrete. If concrete is cured in cooler ambient temperatures (32°F to 50°F) with moisture continually present, strength gain will be slow but the concrete will eventually reach a high strength. 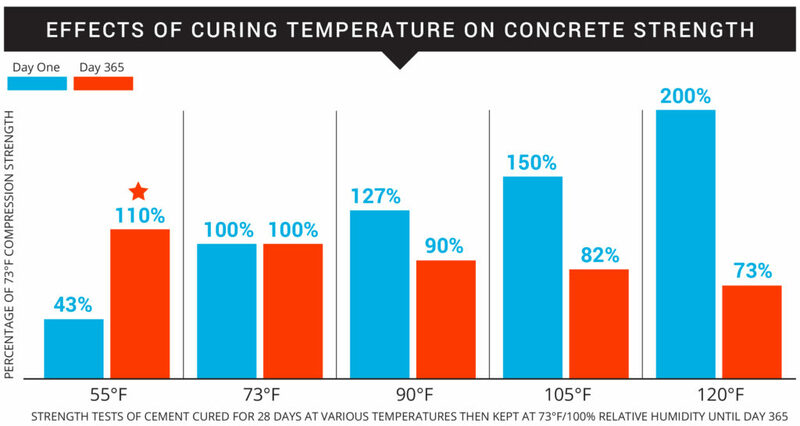 Concrete should not be allowed to get hotter than 90°F or to dry out during the curing period. By “best” we mean “most thoroughly,” not the fastest. High temperatures mean faster curing, but fast curing equates to weaker strength in the end. The following study by Paul Klieger in the Portland Cement Association Research Bulletin 103 illustrates this concept. At an age of 1 day the 120°F concrete was strongest and the 25°F concrete was weakest. By 7 days the high-temperature cured concretes had no more strength than the 73°F concrete or even less. By the age of 28 days the high-temperature concretes were weaker than the 73°F concrete. From 28 days to 1 year the 55°F concrete was considerably stronger than the 73°F concrete. All of this suggests that, provided there is continuous curing, concrete cured at about 55°F for the first 28 days ultimately reaches the highest strength (Concrete). Hot weather concreting doesn’t simply involve temperature. High ambient temperatures, winds, and relative humidity all play a role in “hot weather.” Under hot heather conditions, the primary curing issue is having the top of the slab of concrete dry much faster than the bottom. As concrete dries it shrinks. This means that the top will be shrinking while the bottom is not. This creates internal problems with the concrete that will result in a damaged slab. The top and the bottom of the pour need to cure at the same rate (Placing). Powerblanket ICE is portable cooling equipment that will keep newly poured concrete safe from heat. Portable, insulated, and efficient, Powerblanket ICE effectively regulates the temperature of concrete under both regular and hot conditions. The Powerblanket ICE Circulation Blanket is combined with either a cooler or chiller to achieve optimum results. The Circulation Blanket draws heat to the blanket in order to cool the concrete. Can you pour and cure concrete in the winter? Powerblanket concrete curing blankets provide a manageable way to cure concrete effectively and confidently in the cold weather months. Even in warm weather, Powerblanket curing blankets increase production by rapidly curing with consistent, even heat. Powerblanket understands what it’s like to work on large concrete projects when the weather and temperatures aren’t cooperating. From the Statue of Liberty to a major interstate bridge in Kansas City, we’ve been a part of the action and have proven our products to be the best in the industry. For more info on solutions, check out Powerblanket’s Concrete Curing Blankets and find one that fits your needs best. Reilly Construction out of Wrightstown, NJ, won a bid from the U. S. Department of the Interior to replace the roof of The Great Hall Statue of Liberty National Monument. The Great Hall, which now houses the Ellis Island Immigration Museum, is considered one of the most symbolically important structures in American history. The Great Hall-Ellis Island was proclaimed a part of Statue of Liberty National Monument and is listed on the National Register of Historic Places. Reilly needed extra heat in the form of curing blankets to make this job happen. The project involved removal of the existing inverted roof membrane assembly (IRMA) and replacement with a new multi-ply modified bitumen roofing system over a complicated tapered insulation deck assembly, approx. 60,000 Sq. Ft. The project also included the replacement of custom fabricated copper flashings and accessories throughout and the installation of a lighting protection system. Reilly worked with the NYS Historic Preservation Office (SHPO) to coordinate all the work. Dan DeSantis, the Senior Project Manager for Reilly, found Powerblanket products online and left his contact information. Upon follow up, we discovered that Reilly needed a heating solution to cure the masonry block work at the proper temperature (50°F/10°C) during December in New York and with the added chill of the water. Reilly used five Powerblanket MD0520 concrete curing blankets for the application, and appreciated the increased temperature control. Powerblanket concrete curing blankets provide a manageable way to cure concrete effectively and confidently in the cold weather months. Even in warm weather, Powerblanket curing blankets increase production by rapidly curing with consistent, even heat. Why Choose Powerblanket Concrete Curing Blankets? We talk a lot about the dilemmas posed to concrete curing during the cold winter months, and for good reason too. It’s difficult to get concrete to cure well when the temperature drops. But what about when the weather is hot? True, fewer problems exist for concrete curing during the summer, but excessively hot temperatures can cause concrete to cure too quickly. Don’t worry; we’ve got you covered here too, with our concrete cooling. We all know that summer is the ideal time for construction projects, and concrete pouring is no exception. But when the summer months get really hot, it can be a little too much of a good thing. In fact, concrete cures best in a range somewhere between 70° to 80° F. As you approach numbers as high as 90°, however, you’ll start to run into problems. Concrete experts suggest that if you anticipate experiencing temperatures higher than 77° F after pouring your concrete, you should have a plan for remedying the effects of the high temperatures. Since temperatures above 77° F are very common in the summer months, you’ll need to have a concrete cooling solution in place. Why, you may ask? Because when concrete is poured in high temperatures, it can cure too fast. One of the major concerns with really short curing times is the reduction of strength due to the demand for high water content during high curing temperatures. Pouring concrete in hot weather also poses the risk of dehydrating the concrete, which will lead to shrinkage and cracking. With these risks in mind, it becomes imperative to have a plan in place for combating the hot weather, and we have just the solution for it too. Powerblanket ICE uses Powerblanket’s patented heat spreading technology in reverse to draw heat away from the concrete while simultaneously circulating coolant throughout the blanket surface. All three types of Powerblanket ICE cooling products are portable. (Both the ice box and chiller driven systems require 120VAC). See the Powerblanket ICE cooling product pages on our website for details. We can provide Powerblanket ICE cooling products for custom applications quickly and cost effectively, just like our heating products. Just get us the details, and we can have a product in your hands in just a few weeks. Powerblanket ICE prevents shrinkage and cracking by maintaining the ideal curing temperature during hot weather. Don’t take a chance with the hot weather this summer. Reach out to us today for a quote on Powerblanket ICE products. The business of precast concrete manufacturing is one where you often have to hurry up and wait. Once you pour a precast form, you then have to wait for the time-consuming process of allowing the form to fully cure. The importance of proper curing can’t be undermined, but what if it could be efficiently and safely sped up? What if we told you that you could speed up your precast concrete curing process, without the use of any additives, by as much as 300%? If you’re first thought is: prove it, then we would love to. In fact, it may interest you to know that the inception of Powerblanket heating solutions all started with concrete curing in the first place. We’ve been in the business of increasing concrete-curing efficiency for many years, and our solutions have been proven and tested innumerable times over to increase curing efficiency without any of the common side effects related to other forms of acceleration. Additives can dehydrate your concrete and leave you playing a game of gains and losses. But Powerblanket custom precast concrete curing solutions keep your concrete insulated and hydrated throughout the curing process. Our patented blend of technology allows for the even and consistent curing of precast forms of all shapes and sizes. So rather than balancing the pros and cons of using additives or accelerators in your concrete forms, let us show you a solution that creates no setbacks, only progress. To learn more about our precast curing blankets, select the button below for the infographic. If you’re in the business of precast concrete, then you know how frustrating it is to have to pour once a day. When it comes to precast production, the curing time for concrete simply isn’t very conducive to a good production turnaround. But what if you could increase your cure rate by 300%? Well, read on, because you can. The inception of Powerblanket over one decade ago actually spawned from the use of certain technologies (our innovative approach to heating solutions) in order to cure concrete faster and more efficiently. The idea for accelerated concrete curing was no new idea. Chemical admixtures were used to increase the cure time of concrete before Powerblanket came along to change the game. But the problem with chemical additives is that they dehydrate the concrete as they speed up the curing process. And as any concrete expert knows, that’s a big problem. The Powerblanket solution, on the other hand, keeps the moisture in the concrete while producing insulation, protection, and heat—all of which increase the curing efficiency by 300%. That’s right, and in the case of pouring concrete into forms, well, such an increase makes a real difference. Adding customized Powerblanket heating solutions to your precast concrete business means that you can increase your throughput substantially. If you’re pouring only once a day, adding a Powerblanket solution to your process means you’ll be able to pour three times a day. And the beauty of Powerblanket heating solutions is that they’re easy to install, remove, transport, and store. So when a form of concrete is cured, you can remove the blanket quicker than the form itself. Additionally, Powerblanket heating solutions can be customized to fit just about anything. So if you use unique precast forms, there’s no need to fret. To put it simply: if you can build it, produce it, or store it, Powerblanket can cover it. You may recall the article we posted about our recent involvement at the 2015 World of Concrete. If not, you can read all about it here. But if you’re wondering what the latest is in the world of concrete, just read on. The 2015 edition of the World of Concrete (WOC) was apparently the largest and most celebrated in six years. More than 55,000 attendees were present with access to 1,459 exhibitors. Among those exhibitors was Powerblanket and our concrete curing sample. 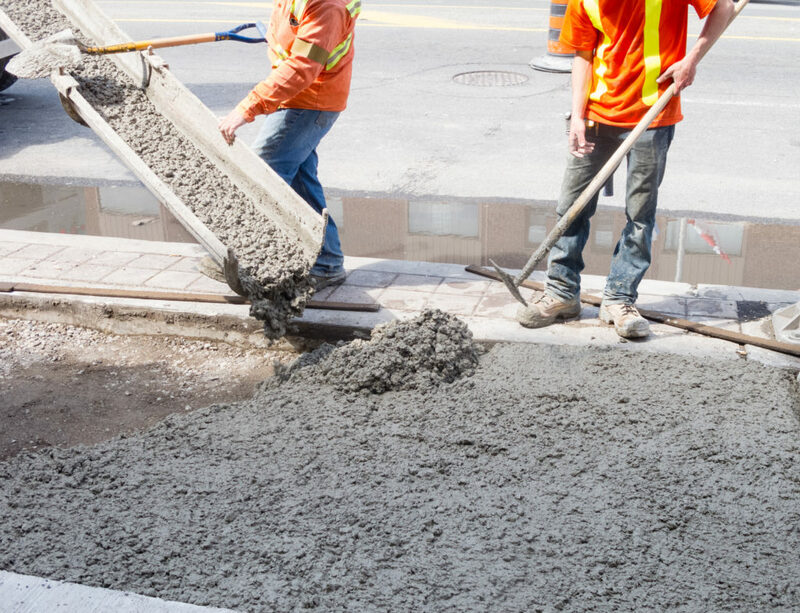 Helping to cure concrete faster and more efficiently is one of our proudest contributions to the construction industry. And to speak of the construction industry as a whole, this year’s WOC was a great illustration of the growth and recovery the industry has experienced lately. Concrete projects are on the rise for the same reason that so many other projects are. The construction industry has been experiencing a real rebound lately, and when both single-family housing and commercial construction are on the rise, it’s always good news for the concrete industry. The WOC this year brought hundreds of opportunities for industry leaders to network and present cutting-edge technologies fit for a sector experiencing considerable growth and increased opportunity. The Powerblanket exhibit was a chance for us to collaborate with Structural Service Inc. to showcase the amazing curing capabilities of our concrete curing blankets. A 600 square-foot concrete slab was poured for use in a concrete polishing and repair workshop for the event, but before that slab could be used for such, it had to be fully cured. This is where we had our chance to shine. Under traditional circumstances, concrete cures for a minimum of ten days before it’s ready for polishing. But for the sake of the showcase, Structural Services needed the slab to reach minimal strength requirements within 24 hours. To make a not-so-long story even shorter, Powerblanket concrete curing blankets made it all possible. If you read our article on the upswing in the construction industry (see “Construction Industry Experiences a Turnaround In 2014”), you’ll know that the future looks bright. The economy has started to rebound and construction projects are increasing again. But after a general increase in business, construction companies now face a new challenge: a shortage of skilled workers. Skilled Labor Lacking for the Construction Industry? Since the upturn in the economy, the construction industry has begun picking up again. This has been the case with many other sectors too, but not all of them are experiencing the same dilemma that construction is. When the economy started to decline and building projects began to wane, many people were left without the steady employment they needed. Construction looked like a dead end for some, and frankly, companies couldn’t afford to keep their skilled workers employed for jobs they didn’t have. Sadly, many construction workers lost their jobs or left to find employment elsewhere. Now, some are saying that this large migration has caused a shortage in skilled labor for the industry, and that the increase in business has created a void that needs to be filled. Others, however, suppose that those laborers are still out there, that there are likely many still unemployed or looking for work, and that the claim of a shortage is just another way of saying that the upturn in business is slower than many had hoped. Perhaps it’s a combination of both. Whatever the case may be, one thing is certain. Interest in the industry is something that leaders of companies are really focused on improving. The word in the news is that many schools are actively participating in the education process regarding jobs in the construction sector. With business on the rise, interest is on the rise, and where there’s a will, there’s a way for companies to find, recruit, or educate the skilled laborers they need. If you’re a mason, or you run a construction company employing masons, then you know how much the cold retards masonry work. With today’s technologies and old-school techniques for cold weather masonry, many companies continue their work well into the winter months. Heating mortar ingredients is one way to keep working when it’s cold, but if you’re doing so through traditional means, let us show you a better way. Every mason knows that when the water in your mix is exposed to near freezing and subfreezing conditions, it drastically retards the curing time of your work. In addition to this, it also compromises the strength of your project. When the temperature drops, the setting time for mortar increases almost tenfold. Because of this, the amount of water left in the mortar is also affected. An extended set time means that the water has more time to evaporate or make its way into the masonry units. After this occurs, you have less water to react with the mortar, and thanks to the cold temperatures, it’s really not reacting much anyway. These are the dilemmas posed by cold weather masonry, but the solution to the problem is pretty straight forward. Masonry work can be continued in cold weather if two precautions are adhered to. The first precaution is to heat your mortar ingredients, especially the water. Heating the water before mixing will allow it to stay at the ideal temperature for much longer. The second precaution to take is to keep the masonry unit above freezing after it’s all been laid. There are different techniques masons employ to accomplish this, but one of the more effective and economical approaches is the use of curing blankets. A curing blanket that both heats and insulates is the ideal choice. This will allow the units to remain at the ideal temperature for the duration of the cure. In fact, a good blanket will actually speed up the curing process significantly, ensuring a fast and strong cure. As far as both precautions are concerned, Powerblanket can help. When it comes to preheating the water for your mortar mixture, Powerblanket®Barrel, Bucket, and Tote Heaters can heat any of your ingredients to whatever temperature is needed. And for the curing process, consider Powerblanet® Concrete Curing Blankets. Not too long ago, the news for the construction industry was less than favorable. However, after a period of recessed business, the industry is on the rebound in the western states and across the nation. Now the challenge is finding enough skilled workers. The steady increase in new single-family homes has been one factor to contribute to more construction projects over the last year. But some companies have also reported nearly doubling their efforts in commercial construction. After the recession took a toll on the amount of money people and companies had for building, the construction industry has been in decline itself in all areas, including commercial projects. But with the tides turning, leaders and managers of construction companies now face a new and growing challenge. In today’s world of technology and computer-aged professions, it seems fewer young people are expressing interest in construction jobs, and this waning interest has many leaders in the industry concerned about its future. With construction projects now on the climb again, an increasing workforce is needed as much as it has ever been. However, despite the demand for professions in the construction industry, there isn’t widespread interest to match it. In fact, some experts suggest that by the year 2020, as many as 2 million construction jobs will be available nationwide. And yet, the inevitable truth is that there won’t likely be 2 million skilled workers ready to fill the void. When the industry took a hit years ago, like so many others did, skilled construction workers were forced to reconsider their future careers. Many left construction for other pursuits, and few have returned. With this reality as an ever-present challenge for leaders and managers of construction businesses, they are taking initiative to help fuel the interest in the youth of the nation. Seminars at colleges and in schools are helping to spark interest in the minds of many. So while the construction industry has this particular challenge on the horizon, there is hope for a supporting generation of new construction-minded individuals who will work to build America’s future. Any given construction job could benefit from increased productivity. Apart from equipment costs and the expense of labor, inefficiency in the execution of a project can eat into your profit margins like nothing else. But the solutions to increase and maintain productive work can be relatively simple to employ too. It’s an easy thing to start into a project without much planning to go ahead of it. This is especially true as your experience grows in certain project types. But regardless of your experience, a well-thought-out plan can help you limit your costs and improve your construction productivity. There are enumerable examples that could be cited to support this case, but here’s a simple one to think about. Suppose you’re pouring concrete for a sidewalk outside of a private community college in your hometown. You have plenty of space to bring the trucks in close enough for the pour, but what you didn’t anticipate, until you started, was the rain clouds gathering overhead. Perhaps this is an overly simplistic scenario, but it can help you think about what sort of matters can throw a wrench into productivity. Taking a few moments to check into the weather forecast could save you a lot of time and headache in such a case as this. The ideal situation would be to have a crew that is directly experienced in every job you undertake. This may not always be the case, however. So you should keep in mind the need for training and planning with your crews regarding the tasks that need to be accomplished and the most efficient way to go about accomplishing those tasks. A little bit of game planning with your team can go a long way in preventing the need for reworking misunderstood initiatives or subpar results. Another way to ensure that you limit your losses when executing your construction projects it to keep the necessary equipment on hand, and not only the necessities per se, but equipment that is high in quality too. It goes without saying in most cases, but it’s worth mentioning here that lower-quality equipment can end up costing you a lot more money in the long run should it fail. Not only does quality play a main role in making use of productive equipment, but efficiency is equally important. Obviously, if you’re still framing with hammers, then you’re missing out on the massive increase in efficiency offered by a pneumatic nail gun. Along with apparent examples like this one, there are other tools that you may not be using that could help you with your planning and execution. Consider the many communication tools that help keep your crew on the same tight schedule, which can inform them of changes to a plan at a moment’s notice. Think also of the many options in management software that can help you with your supply, inventory, and assignment protocols. When it comes to supplying your crew with the building materials needed, having vendors and manufacturers you can count on is an essential element to the equation of productivity. If you’re constantly having to deal with slow turnaround times, backorders, or costly delivery charges, it’s going to eat into your profit margin really fast. Just because one particular supplier has the cheapest price for a certain material doesn’t necessarily mean they are the best value. If they can’t provide timely and consistent deliver of supplies, then they’ll be costing you money in downtime, and downtime adds up a lot faster than product prices that are slightly higher. And finally, perhaps the most important step to take in increasing productivity on the job site is to communicate the goals and expectations to everyone involved. Getting everyone on the same page is paramount when it comes to maintaining a productive workflow. This concept should be first applied in the planning and training phases of the process, but should also be reaffirmed many times throughout the project. Help everyone understand that completing the project in a timely and efficient manner creates positive results for everyone. Incentivize good work and prompt completion of tasks from your crew. Keep your people a closely knit team and success will certainly follow. It’s apparent to anyone who works in the construction industry that the summer months are the prime time to get things done. When winter rolls around, however, construction projects often move to a slow crawl or a screeching halt. But what if you could remedy that fact? How great would it be to possess the ability to work your construction projects year round? Any construction company would love to be able to continue temperature-sensitive tasks into the winter. But in a lot of cases, it just doesn’t work. Thanks to the effects cold weather has on curing, storage, and application of common construction material, construction season doesn’t do too well outside of the warm months. There just isn’t any real way to cure concrete in the cold, apply spray foam in below-freezing temperatures, or thaw topsoil for digging preparations…or is there? Thankfully, there is a way to ensure that certain construction projects remain operable in the cold-weather months. Of course, there’s no way for us to change the weather patterns, but we can lessen the effects freezing temperatures have on material usage and application. For example, concrete doesn’t cure in cold temperatures nearly as well as in warm weather, but if one could add a curing blanket to speed up the process and make it even faster than a natural cure in 90°, well, that would be phenomenal. This is even more apparent in epoxy applications, where the necessary temperature range for curing is even higher. And what about spray foam? How can you keep the proper consistency for application when cold weather compromises its characteristics? Wouldn’t it be great if you could apply a heating element that enabled an evenly-distributed amount of heat to warm the mixture to the ideal temperature and keep it there? Frozen topsoil is another project dampener. Whether you need to dig to repair a pipe or simply need to get past that frozen topsoil, Powerblanket® Ground Thawing blankets got it covered. From concrete curing to spray foam storage and prep, Powerblanket products can enable cold-weather construction and help keep your business going year round. Find out how Powerblanket has helped other companies like yours by downloading these free case studies!